We’re back today with another Protagonize 2.0 feature overview! A couple of days ago, we talked about page markers and how they’ve been revamped in the new interface. Today, we’ll talk about another major new feature that is quite intertwined with page markers, as well as recommendations, favourites, and the authors you follow: the Reading List. The reading list is meant to be a helpful pointer to stuff you might be interested in reading on the site. It’s an aggregation of your marked pages, your favourites, and your recommended works, as well as what authors you follow are reading. Think of it as a new type of activity feed or “timeline” that only contains stuff you might be interested in reading — no other distractions. Unlike on the old site, where a lot of those items were hidden to anyone other than you (i.e. 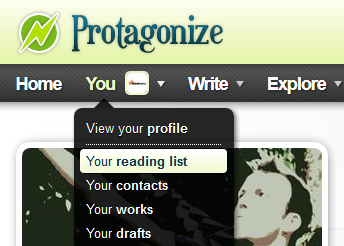 you couldn’t see the page markers or favourites of other authors), the reading list is now a public part of your profile. This means that you can go and check out what your friends and authors you follow are reading, too, and use the lists of others as inspiration for your own reading. Using the reading list is quite straightforward. Your default view, the “All” filter, is a merged view of everything that’s going on between yourself and the authors you follow. Think of it as the “fire hose”, which you can then sort and filter to your heart’s content. You can then filter on page markers, favourites, authors you’re following, or works you’ve recommended. 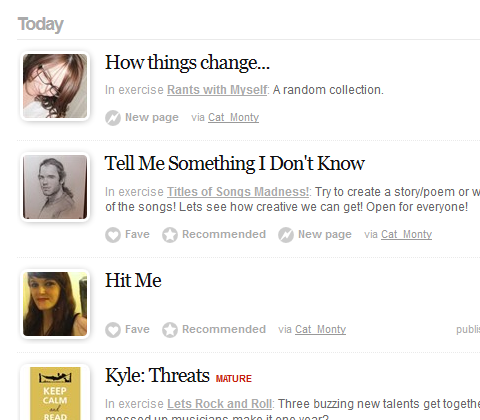 You can also narrow the listing by work type (story, poem, exercise, etc.) and sort the list by various orderings, using the drop-down menus on the right-hand side. This gives you a good amount of control over what you see, and how you want to see it. Items from authors you follow are limited to the last 90 days in order to keep things reasonably fresh all the time. Wondering what each reading list entry consists of? Let’s look at an example. As you can see in the screenshot above, the title of the work or page in question is shown first, along with the author’s portrait. Below, you’ll see the work summary, as well as the originating work’s title, if you’re looking at a work page. At the bottom of each entry, you’ll see the actions that took place (i.e. whether the item was recommended, marked, or favourited), the user who referred the item (if it’s coming from an author you follow), and the date the item was published. Depending on your filters and sort criteria, the fields below each entry will vary slightly and show different pieces of information. There are still a couple of kinks we need to work out with duplicate entries, but overall it should be a major improvement over what we had previously. The reading list is meant to ideally be a discovery tool to let you jump in and see what your friends are reading, as well as keep track of what you’re reading at the same time. I encourage you to spend some time checking out not only your reading list, but those of other authors on the site. I’d love to hear what you think about it in the comments below! This entry was posted in General, Site mechanics, Tutorials & Walkthroughs and tagged Features, overview, protagonize 2.0, reading list, redesign, walkthrough. Bookmark the permalink.